Commercial sized electronic alternative to ion-exchange water softeners that will prevent mineral deposits and remove existing scale. The VERTEX HardWaterWizard is an electronic alternative to ion-exchange water softeners that will prevent mineral deposits and remove existing scale. 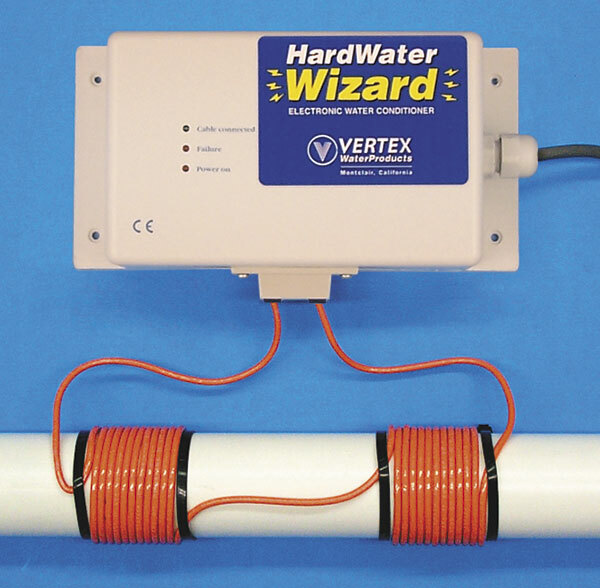 When installed on the inlet water pipe, its continuously oscillating electric field changes the property of the hardness minerals so they stay in solution and don’t deposit on pipes and fixtures. These models are designed for larger pipe sizes, higher flow rates and higher concentration of hardness found in commercial applications. It works on galvanized steel, copper, and pvc pipes. Signal “on” light and operating light. Red fail light should be off.